The UCC of California is fortunate to have many excellent musicians who share their talents to add to our worship services. Through the school year, our three choirs provide music for most of our services. During the summer months, groups and individuals perform vocal and instrumental anthems. We invite all who want to participate to join us. 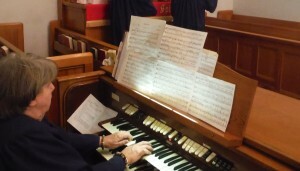 Renee Clifford is our organist and accompanies both vocal choirs.